In order to set up the Custom Slider, go to Appearance > Customize > Front Page > Banner / Slider and select Custom Slider. This is a slider where you can specify your own images and captions without being bound to a category or posts. You can add as many slides as you want! When this option is selected, a new section with a button saying “Add new Slide” will be shown. 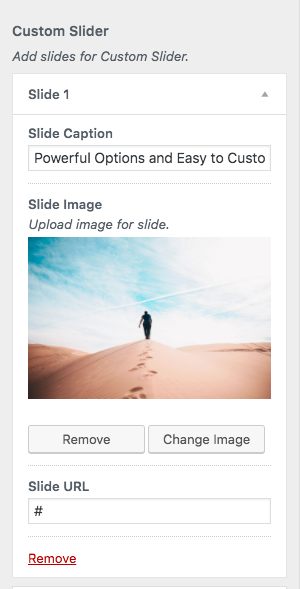 Click “Add new Slide” and you will be presented will all the options for a new Slide item. Upload an image, enter a caption and a URL. The optimum image size for the slider is 1170 x 550 px (for the default style) and at least 870x550px for the style with thumbnails.